Love Snaps’n’Claps but want pro-level control over cluster density, timing, pitch, filtering, and more? 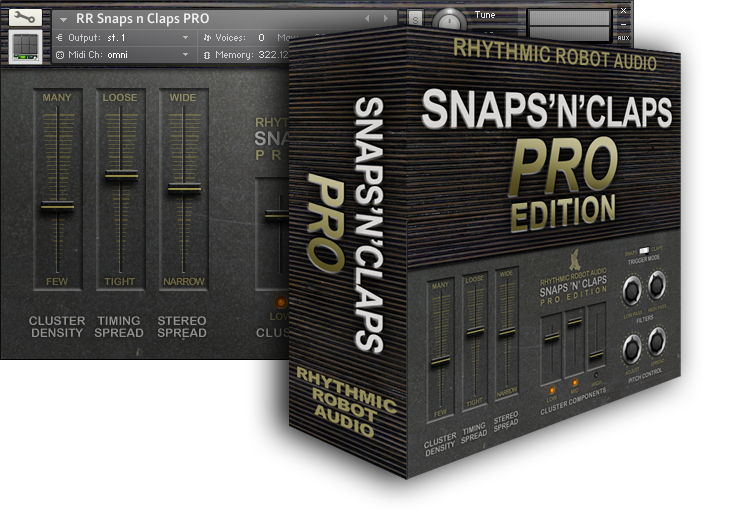 Check out Snaps ‘n’ Claps PRO for pro-studio-grade hippies in a tin! Finger snaps and hand claps – let’s face it: what track couldn’t benefit from them? Well, all right, maybe your death-metal post-apocalyptic breakbeat fusion band might not reach for these on a daily basis, but for the rest of us, there’s always a time when a handclap or fingersnap backbeat is just perfect for adding a touch of old-style class to a track; or lending your guitar melody that 60s vibe; or injecting a bit of human presence to your beat; or nailing that flamenco spirit. Mardi Gras! Campfire singalongs! Protest anthems! There’s always a time for snaps and claps. Unfortunately, up until now, that time has often come just when the flower-girl vocalist is making out with the bongos guy, and the hippie you got in to play the tambourine is too stoned to keep time. What you need is reliable snaps ‘n’ claps, in a little metal tin, that you can fire up without risking RSI in your snapping hand. Rhythmic Robot Snaps ‘n’ Claps is a little miracle of simplicity. We sampled a handful (ha! handful!) of finger snaps and hand claps. In fact, we did it twice, with high- and low-pitched variants of both. (At last, Mongo’s outsized hands have come in useful for something.) The front panel is pretty self-explanatory: use the little crank to select how many snaps or claps you want, and hit C4 or D4 for snaps, E4 or F4 for claps. That’s it. Oh, there’s a tuning control to alter the pitch further if you want to. 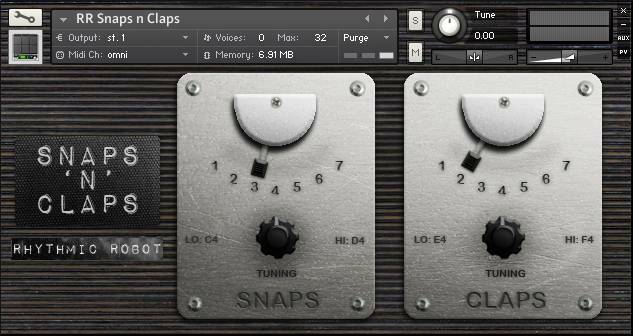 The snaps ‘n’ claps you get are recorded dry, and are randomly varied, so there’s none of that machine-gunning to worry about; and there’s a subtle stereo spread as you add more snaps ‘n’ claps. Want more snaps ‘n’ claps? Hit two keys together for ALL the claps, or ALL the snaps. Want still more snaps ‘n’ claps? Want Wembley Arena doing the “Keep It Cool, Boy” refrain from West Side Story? Or the Slow Handclap of Death over your mate’s demo track? Just fire up multiple instances of Snaps ‘n’ Claps! Whatever your snap- or clap-based needs, Snaps ‘n’ Claps delivers. Snaps ‘n’ Claps: more reliable than stoned hippies. 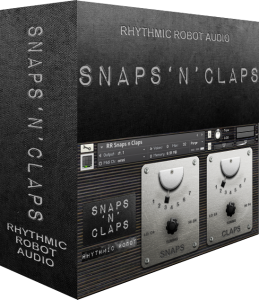 A hint for using Snaps ‘n’ Claps: Because the clusters of sounds recorded in Snaps ‘n’ Claps inevitably trail the beat somewhat – they’re spread out in time, and they have to spread after the beat at which you play the note – it can really help to tighten the feel of the groove if you tweak their timing after recording them. Once you’ve recorded (and, if you wish, quantised) your Snaps ‘n’ Claps patterns, select them in your DAW and very slightly nudge them ahead of the beat. That way the mid-point of the cluster will be brought on to the beat and the overall groove will tighten up hugely. It’s cheap and useful, but the GUI is not that intuitive. Great organic vibe and variation for rhythm tracks. As stated, snaps and claps, and as another reviewer noted, they’re bone dry, which means it’s BYORl bring your own reverb, which I prefer anyway. The sounds of this are extremely versatile and well recorded (it is very dry, just “slap” some reverb on there and it sounds that much better!). The feature allowing you to choose how many snaps or claps playing simultaneously is a great bonus, allowing you to add sounds both to louder / more intimate pieces. This is another instrument that is useful for ANYTHING. No matter what type of music you make, this will come in handy. And as always with RR products, you can’t beat the price. Has already allowed me to add snaps that focus the naturally recorded snaps of a small ensemble. Just a touch of this broadens the mixing possibilities quite a bit. Definitely a no brainer for a pop production! Snaps’n’Claps was an incredibly useful tool to have when I was looking for body sounds to form a vital part of the score for “The Runner”. Have a look for yourself: The Runner, AU 2014, shortlisted at Cannes Short Corner. Thanks a lot to the Professor and Mongo!